To kick off this year’s National Ladder Safety Month, we will be discussing OSHA’s program (Plan, Provide, Train) and how you can apply to ladder safety to prevent injuries and save lives. When working from heights, employers must plan projects to ensure the job is done safely. Begin by deciding how the job will be done, what tasks will be involved, and what safety equipment may be needed to complete each task. Attendees will learn advanced planning and training techniques and principles. You will also learn about the latest innovations in fall protection, fall prevention and ladder safety from several manufacturers. David Francis has been in the ladder business for over thirty years. As a college student he cleaned the offices of Little Giant Ladder Systems at night and has stayed with the company ever since. Working his way up the ladder (pun intended), Dave became the Director of R&D and holds five U.S. patents for improvements in ladder design. He is now the National Safety Director, with the sole purpose of preventing ladder accidents and hopefully saving lives by promoting ladder safety training and innovation in safe ladder design. His goal is the same as yours, getting everyone home to their families at the end of the day. 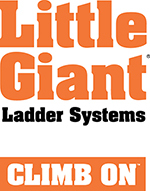 If you are interested in free ladder safety training, please complete the Contact Us form, or contact Dave at dave@ladders.com or 801-362-8586, or visit www.littlegiantladders.com.